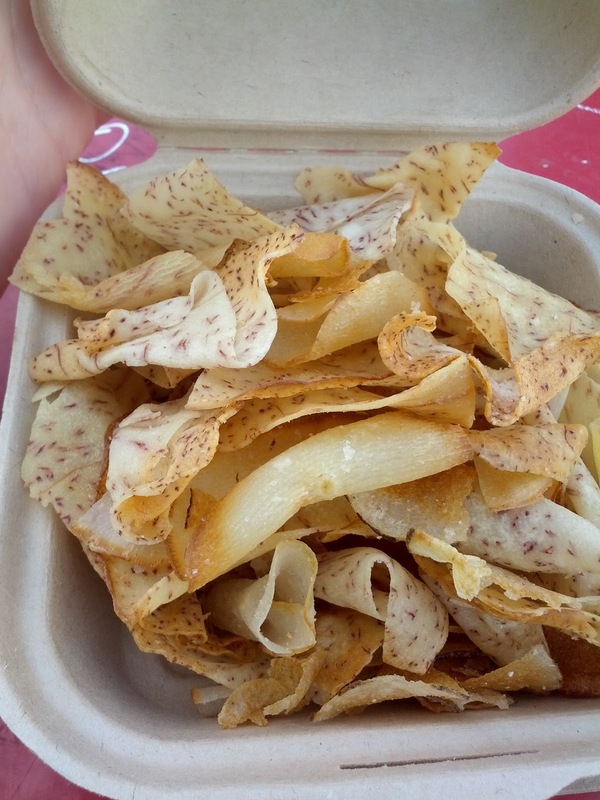 "Say goodbye to greasy chips that are full of artificial flavors and colors. The Daily Crave Veggie chips contain none of the "bad stuff" but still gives you all the great taste you desire." These just really don't taste like ... anything. There are three colors, but they taste identical, and not like any veggie I could pick out. Plain green, plain red, and plain orangish, I dubbed them. The color is natural, the green comes from spinach powder, the orange from tomato powder, and the red from beet powder. The texture is also a bit strange, since they are made from potato and rice flour, not slices of potato. And ... besides that, they have no taste. Oh, I take it back. They do have a taste: salt. Very salty. Meh. But at least vegan and gluten-free? I'm constantly on the lookout for things to munch on, as I'm a serious snacker. Particularly salty, crispy things. So I was excited to find The Daily Crave, as the products sounds interesting. They make veggie chips, veggie snicks, and "veggie skinniez". All are vegan. The packaging was exciting. They looked good on the outside. But unfortunately, I didn't like the one variety I tried at all. I don't really see a reason to try the rest of their product line. 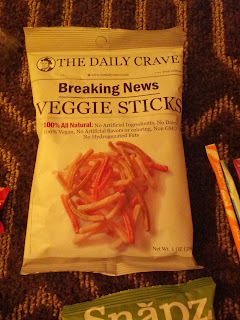 The veggie sticks looked like crispy french fries in the picture. They came in a trio of colors: slightly green, slightly orange, and slightly yellow. But, they didn't look great in person. They tasted about how they looked. Just like the colors, the flavors were muted. They didn't really taste like ... anything. One other reviewer said they tasted like packing peanuts. I thought more like styrofoam. You know, if we'd actually ever consumed those things. The only enjoyable part to them was that they were crispy and crunchy. I was curious about what was in them, so looked at the ingredients. It turns out that "veggie sticks" really just were potato flour, rice flour, and oil with some tomato powder, spinach powder, and beet powder added to give them color, and presumably, market them as something other than potato sticks. Meh. I certainly wouldn't get them again. Sabores del Sur is local small catering company, specializing in South American treats. They were born out of the La Cocina incubator program, where I discovered their treats at the La Cocina stand in the Ferry Building. Now, in addition to catering, they also have a restaurant. Certainly a La Cocina success story. I don't know anything about their catering business, but their sweet treats, the alfajores, are known all over town as the best. 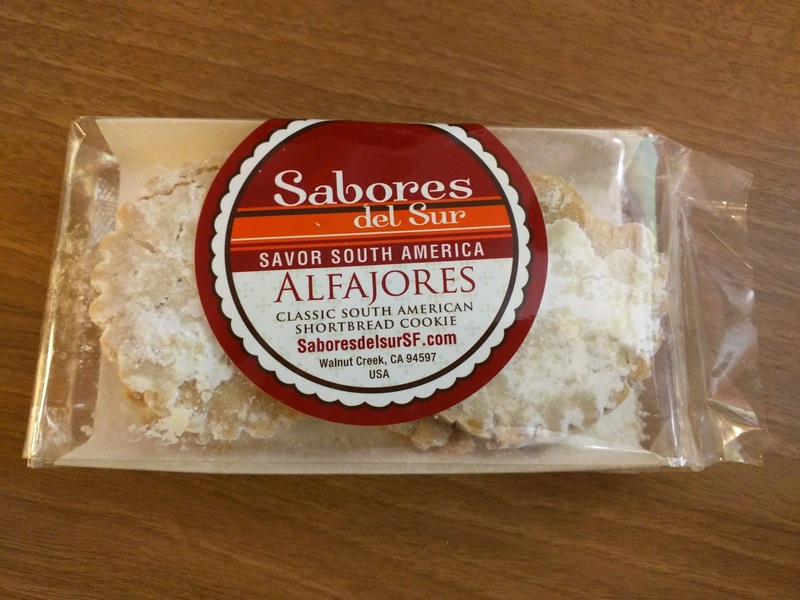 You can find the alfajores at cafes around town, and even at Whole Foods now. Even though I'm not a huge cookie fan, I had to try them, because, well, if the are the best, how could I not? I'm sooo glad I did. “Delicate round butter cookies filled with creamy dulce de leche caramel and dusted with white powdered sugar”. I tried one, still expecting "just a cookie", and figured I'd hand over the package to Ojan. I was shocked. These were really good! The cookie was buttery and delicious. The filling was sweet, who doesn't love dulce de leche? The powdered sugar all over them added even more sweetness. Alfajores seems to be very ideal pairings with black coffee. I also had a package that somehow got old before I broke into it. The cookies were not stale tasting exactly, but they crumbled into tiny bits and developed a chalky texture. Whoops. The filling got a bit crunchy, rather than creamy, which I actually liked, basically like a cross between dulce de leche and toffee. I extracted the tasty filling and just ate it on its own, which was perfectly enjoyable. But, uh, don't let them get stale. I do love brunch, but that is not why I swung by Radish one day. You see, they are also known for ... their root veggie chips. Yes, really, I'd go out of my way for chips. 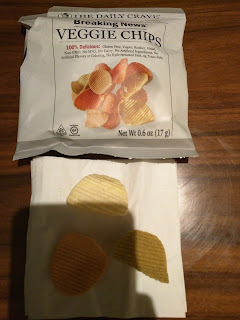 I've been exploring all sorts of chips, and root veggie chips are far better than standard potato in my mind, so when I read that Radish makes house made root vegetable chips that people seem to love, I had to pick some up. I'm not certain what types of root vegetables were included, but there were at least two kinds, including taro. Mmm, taro, an ingredient I absolutely love. The chips were indeed kinda awesome. Thin, very crispy, great flavor, nicely salted. Obviously fresh made, so much better than any packaged chips. Yes, just the chips alone were great, but obviously I wish that, like the plantain and root veggie chips at Le Mar, they came with awesome dipping sauces. As you read last week, I recently travelled through O'Hare airport. I visited Tortas Frontera for my savory food, and then eagerly set off to TCBY to get some froyo. There was a TCBY in my hometown when I was growing up, and I recall going there for a splurge from time to time, getting a "shiver", with my favorite candies mixed in. Definitely my introduction to froyo, and I hadn't encountered TCBY in years. I was so excited, particularly since I didn't really love my lunch. I rounded the corner, determined and excited, only to discover that the froyo machine at TCBY was ... broken. I still really wanted dessert, and I had very little time left, and few options. I basically had two choices: Chili's or Romano's Macaroni Grill. I picked Romano's because I did have fond memories of that place too, although not necessarily for dessert. And no, these weren't childhood memories. I only ever visited Romano's in California, when I moved out here. Let's just say I ate very differently when I first moved to California (I was mostly vegetarian, for one), and I recalled being quite into the eggplant parmesan or the create your own pasta options at Romano's. So ,Romano's it was. I was met with a fairly boring dessert menu: tiramisu, cheesecake, chocolate cake, or gelato. I ruled out the melty item, and the ones with caffeine, and settled on cheesecake. New York Style Cheesecake / shortbread crust / fresh strawberries. I laughed when I opened the box. “Fresh strawberries”, eh? And what were these giant chunks of … biscotti? Looks aside, the cheesecake wasn’t very good. It wasn’t very creamy, it didn’t really have any cream cheese flavor to it. Or *any* flavor really. It was just ... there. On top was what I guess was a little whipped cream? It was white, but it wasn’t fluffy or creamy, and also didn’t taste like anything. The white layer was too thin to really tasty anyway, and it only extended part of the way back. Even canned whipped cream would have been better than this. Maybe it was sour cream? But it didn’t taste sour either. I have no idea. The crust was probably the best part, a sweet crumbled shortbread crust. It wasn’t great, don’t get me wrong, but it was better than the cheesecake itself. As were the large chunks of biscotti. When I looked at photos online after, I saw that normally these are little pieces, crumbled up on top. That makes slightly more sense, as the big chunks just seemed strange and out of place. The biscotti had a nice texture, and actually a bit of flavor. Nothing special, but not awful. If I had coffee with me, I would have liked to dunk them. The fresh strawberries were indeed just mushy berries in a way-too-sweet syrup. They were certainly not fresh berries. Fairly awful. So ... yeah. Flavorless cheesecake, sweet strawberry goo, and random biscotti. Not a winner. I've reviewed Panera a slew of times before, including the lackluster muffins, the mediocre pastries and cookies, the fairly tasty bagels with awesome cream cheese, the decent beverages, before finally finding a really good scone. And you've likely been to Panera yourself, so, I have nothing more to say about Panera as a place. 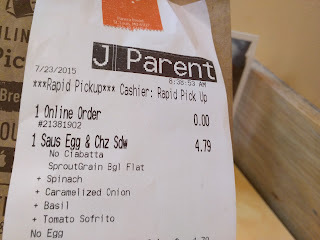 This review will focus on two things: the order in advance Rapid Pickup system, and my first try at one of their breakfast sandwiches. The online ordering was definitely a success. For this visit, I opted to try out the rapid pickup option. You can order online, or through your phone. You can order far in advance, or for "ASAP". The web site was really simple to use, and in fact, it allowed me to discover huge sections of the Panera menu that I never new existed from reading only their posted signs in the cafes. I had NO idea how much I could customize! (more on that soon). Ordering online was easy peasy. As was pickup. They have an entire shelf dedicate to the rapid pickups, and you just walk in, say your name, and grab it. I ordered a hot item, and I was apprehensive about this setup. I asked for 8:45am pickup. Would it be made at 7am and just left sitting? I wanted it hot and fresh! I arrived a few minutes early, and my order was indeed sitting there. My heart sank. And then I picked it up. The bag was hot. I read the tag attached. 8:38:53AM it read. It really had *just* been made. Perfect. So rapid pickup? Definitely a success. My order? Not quite as much, as you'll soon read about. But first, let's talk about the amazing customizations. While Panera doesn't have an explicit "build your own" sandwich option, they allow you to change any element of the sandwiches, so, in practice, you can build your own. Just consider the 10 that they have on the menu as mere "suggestions". To start, the choice for the bread. The pre-made breakfast sandwiches use a few different breads, including bagels (everything or asiago cheese), a sprouted grain bagel flat, slices of whole grain bread, and ciabatta. But if you want to customize it, you have far more options. You can pick any bagel you'd like as the base. Want a chocolate chip bagel with your egg sandwich? Go for it, it might be nasty, but no one will stop you. Prefer a decadent croissant? Sure. Want basic sliced bread? You can pick from any of Panera's loaves. Want some crunch? Go for the demi or baguette. Low carb? Opt for flatbread. Basically, any bread product that Panera offers, you can pick from. Next, the choice of eggs. Whole egg, just egg whites, or a crazy egg white patty-thing with turkey sausage bits inside. Then, cheese. 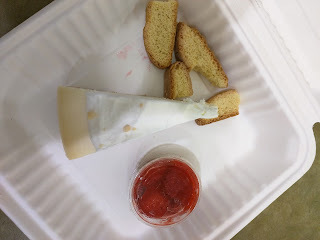 For some reason, every one of the menu provided sandwiches uses white cheddar, but every cheese that Panera offers is an option if you want: gruyere, american, asiago parmesan, cheddar (white or smoked), feta, gorgonzola, gouda, swiss, mozzarella (sliced or fresh). You can sub out any cheese free of charge. If you want more than one cheese, you can add a second cheese for $0.30. Next, meat! The breakfast sandwiches on the menu stick with the standard options of bacon, sausage, steak, and ham. But you can pick any of the other meats that Panera has for the regular lunch sandwiches, so you can put chicken, salami, turkey (roasted or sliced smoked), or even tuna or chicken salad, if you really want. Again, simple swaps are free, additional meats are $1. Finally, veggies. Most of the breakfast sandwiches on the menu do not have veggies and stick with the tried and true meat/cheese/egg combo, but there are a few that add in spinach, avocado, tomato (fresh or sofrito), or basil pesto. But you can probably guess where I'm going here. If Panera has a veggie for other purposes, you can pick it. Want some greens? Add romaine, green leaf lettuce, spinach, basil, or "field greens". Add on cucumbers, onions (red or caramelized), pappadew peppers, or pepperoncini if you really want. Spread on pesto (regular or sundried tomato). So, yes, you *could * create something horrible, like a chocolate chip bagel spread with pesto, filled with a scary egg white sausage crumble patty, topped with tuna salad and gorganzola. Go for it. No one is stopping you. They even have an amazing tool if you order online that builds it visually for you. You can see how uh, amazing it would look. I didn't take it that far. If you read my receipt, you can see that I removed one element of the sandwich, subbed out another, and added 5 extras. So much fun! Sausage, Egg, & Cheese on Grilled Ciabatta (with MANY modifications). $ 4.79. "All-natural egg, freshly cracked every morning, a thick slice of Vermont white cheddar and all-natural sausage all grilled on our freshly baked Ciabatta." Now, take that description, and then what you see above, with a lot of grains of salt. I customized this ridiculously. The only components that I kept were the sausage and cheese. I really could have started with pretty much any of the sandwiches as a base, I just picked this one sorta randomly (and actually, and in looking at it more, I think I would have wound up with fewer modifications if I picked the "Mediterranean Egg White on Ciabatta"). But anyway. I was inspired by the sausage and cheddar breakfast sandwich I had at Starbucks a while ago. It wasn't great, but, flavorful sausage and melty cheese again sounded good. And, unlike Starbucks, at Panera I could customize it, adding in a few more goodies. It had potential, right? The description Panera came up with for my actual creation was "Sausage, Egg & Cheese on Grilled Ciabatta with Sprouted Grain Bagel Flat with Basil with Caramelized Onions with Tomato Sofrito with Spinach with No Whole Egg." To start, I removed the egg entirely ("with No Whole Egg"). The Starbucks eggs were all awful, reheated patties of strangeness. I wasn't convinced that these would be fresh cracked eggs (it says they were cracked "every morning", which doesn't inspire me to believe someone was frying up an egg to order here). I don't even really like eggs to begin with. So I removed it, which I couldn't do at Starbucks, since they are pre-made there. Next, I replaced the Ciabatta with a Sprouted Grain Bagel Flat ("with Sprouted Grain Bagel Flat"). The one item I consistently like at Panera is the bagels, so it seemed reasonable to sub in a bagel as my bread choice. Except I was going to fill my creation with a ton of elements, so I didn't want a big heavy bagel. The bagel flat seemed like a great option, and, although I had only one choice for bagel flat, it looked a lot like the whole grain bagel that I had really enjoyed before, so, I was happy with this. So let's talk about the bagel flat: "Freshly baked bagel, pinched and slightly flattened, made with select ingredients, including sprouted wheat, rye, spelt and oats mixed with whole wheat flour and a touch of honey, then topped with oats." The bagel decision was a good one. Just like the whole grain bagel, it was nicely hearty, I liked the flavor, and the oats on top. The flat was a good choice, the bread didn't overwhelm as I think a regular bagel would (for context, the flat is about 100 calories less than the regular one, so definitely a bit thinner). It had beautiful grill marks on top, since the breakfast sandwiches are grilled (probably to melt the cheese? ), rather than toasted in their standard toaster. The outside was nicely toasted, but the interior was really gummy. So, although this was freshly made and composed on the spot, rather than just magic-ovening a premade sandwich like Starbucks, Starbucks actually wins a bit here, since somehow the english muffins I had both times there came out really crispy and were never mushy. But the bagel flat itself was good, and I'd certainly get just that again, not part of a breakfast sandwich. I added in 4 items: basil, caramelized onions, tomato sofrito, and spinach. I really couldn't resist jazzing it up once I realized I could. I opened it up to see how they choose to handle my additions. I had no idea what order they'd put anything in, as that wasn't something I was able to specify. Spread on the top side of the bagel was what seemed to be pesto. 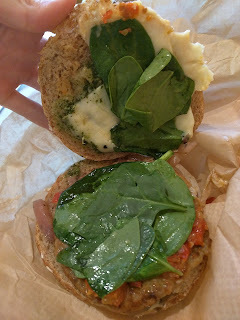 I didn't ask for pesto, but I did ask for basil (and yes both are options), and I didn't see any basil on my sandwich. Some of the other breakfast sandwiches include pesto, so I'm guessing they assumed that is what I wanted? Either that, or the "basil" they include is always finely chopped and pesto-like? Anyway, the basil/pesto was actually my favorite part of the entire sandwich, so I'm glad it was there. 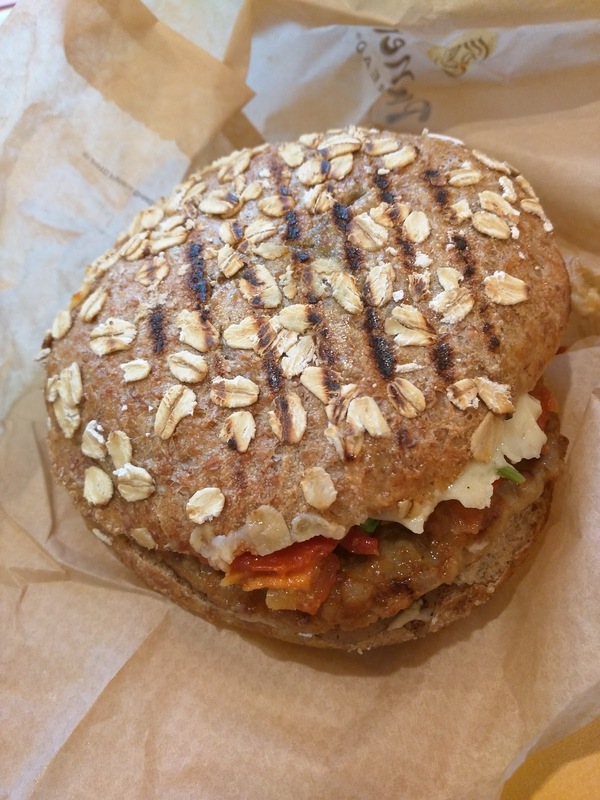 It was super flavorful, and the basil flavor went really nicely with the hearty oat-y bagel. Next came the cheese. I kept the cheese that all of the breakfast sandwiches use, white cheddar. Not really my top pick for a cheese, but really I was just overwhelmed by the slew of other choices I had, so I kept it simple and didn't change it. Plus, if they use it for ALL of the sandwiches, it must be the best, right? No. The cheese was really disappointing. It wasn't really melted, as you can see here. Just slices of cheese, with only the very edges melted. Again, comparing to Starbucks, where they just magic-oven a pre-made sandwich and somehow get perfectly melted cheese, this was sad. The only thing I can imagine is that they somehow normally rely on the egg to melt the cheese? Next came spinach, another addition of mine. Not much to say about it, other than that it was fresh, and the quantity provided was good. Again, it went well with the bagel itself, and it was slightly wilt-y from the heat of the grill, which was nice. So far, flavorful and good, except for the not melted cheese of course. But under the spinach came the tomato sofrito. To be fair, I had no idea what tomato sofrito was. I just added it because it looked like roasted, seasoned tomatoes, which seemed like they'd be great with cheese and spinach, right? I hated it. It was really flavorful, and was sorta like moist sundried tomatoes, which I also never like. The flavor was strong and intense, and took over the entire creation. The not melted cheese kinda sucked, but the sofrito ruined it for me. My own fault though. I scraped off as much as I could, but I still kept getting a taste of it from time to time. Such a powerful element. Proceed with caution. Below the tomato sofrito was the sausage patty. I sometimes really love sausage, which I realize is completely out of character for me. My mom laughs whenever I order sausage patties when we go out for breakfast, she still doesn't believe I like it. What can I say, sometimes, you like what you like, right? And again, the Starbucks one was well seasoned and really not that bad, so, I had hope. 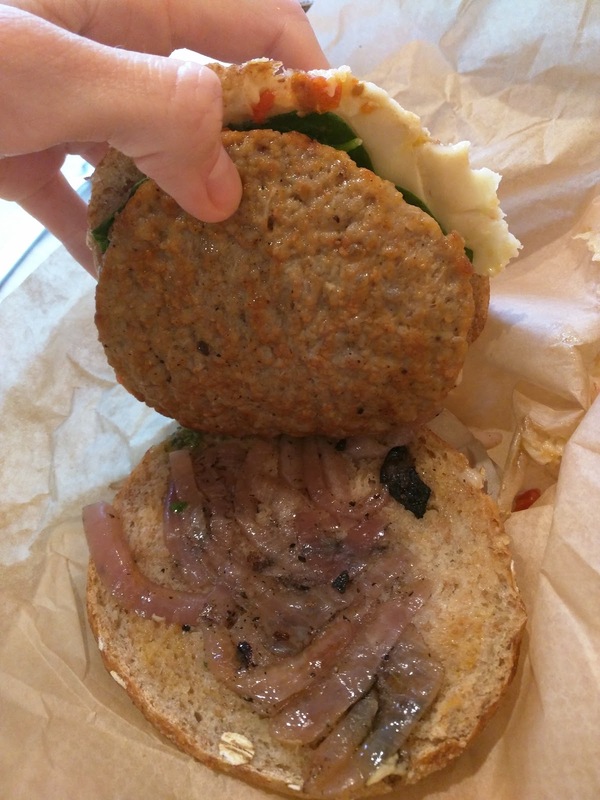 The Panera sausage patty wasn't good. It was really thin, super processed, so ... fake. I realize that is strange to say about something that is always processed, but this was more so than usual. It was covered in the sofrito, which actually worked out well, as I could just remove the sausage entirely and also get rid of a lot of the sofrito. The final element was my last addition: caramelized onion. I love caramelized onions and thought the flavors of caramelized onion, spinach, and cheese would be delicious together. The onion was somehow worse than the sofrito! First, it was red onion, which I wasn't quite expecting. Not a bad thing necessarily, but, just not what I expected. But the real issue? It wasn't caramelized. It was charred. Burnt. There were actual bits of black charcoal in there. Seriously. See all the little black bits? It tasted really awful, I don't know how to describe it besides that. So, overall? A mixed success. The bagel flat was a winner. I liked the spinach and basil. If the cheese had been melted, I think I would have been pretty happy with those ingredients, and would certainly consider getting another, and leave out the sausage, sofrito, and onions. But as it was, no, I wouldn't get another of these. I did really appreciate that I could modify every element of the sandwich, and I think it is strange that Panera doesn't make that more known. There have to be others who would like customized breakfast sandwiches and don't realize how easily they can do it? It was also amazing that even though I modified it extensively, the price didn't change. You can sub out anything free of charge, and add up to 5 extras, without incurring any additional cost.